With the Super Bowl right around the corner, I thought it would be the perfect time to share these amazing Jalapeño and Artichoke Dip Stuffed Mushrooms. I used Baby Bella Cremini mushrooms and stuffed them with an out of this world combination of jalapeños, fire-roasted green chilis, artichoke hearts, and parmesan cheese. The jalapeños and the fire-roasted chilies give these stuffed mushrooms a serious spicy kick, but the cream cheese cuts through the spiciness and really brings the flavors together. 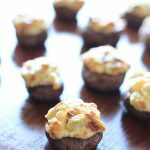 These Jalapeño and Artichoke Dip Stuffed Mushrooms are going to be a huge hit at your next event! 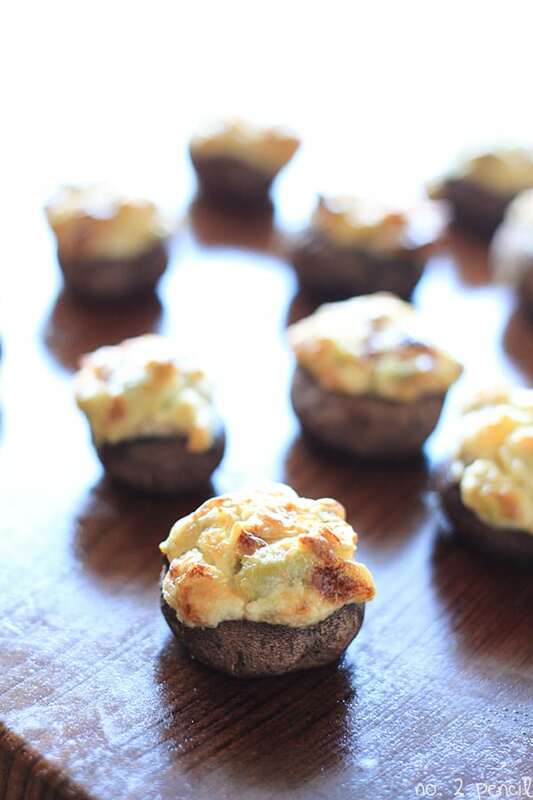 This recipe makes a lot of stuffed mushrooms, around 100-150. It’s hard to say exactly because mushrooms vary in size. If you don’t need that many stuffed mushrooms, you can bake the remaining filling in a 2 quart casserole dish until hot and bubbly. It makes an amazing hot dip that you can serve in a bread bowl or with tortilla chips. 4-5 pounds of Baby Bella Crimini Mushrooms or white button mushrooms. Rinse mushrooms and pat dry. Arrange mushrooms on a foil covered baking sheet for easy clean up. In a medium mixing bowl, combine ingredients for filling. Bake at 400 degrees for 20-25 minutes, until filling is golden brown.